Job loss. Illness. Family emergency. For the 38 million American households living hand-to-mouth, the sudden inability to bring home a paycheck can be catastrophic. For this reason, many experts agree that an easily accessible (liquid) 3-6 month emergency fund should always be kept handy to cover the essentials. While 3-6 months of expenses tends to be a popular rule of thumb among personal finance professionals, this amount can fluctuate greatly depending on what has been deemed essential. As many of you now know, I've recently quit my job. While I'm not planning to be unemployed for long, I'd be lying if I said I'm not slightly concerned about my finances. Yes, I've carefully prepared myself for the inevitable job burnout by trimming down my expenses and saving a large percentage of my earnings. But with only eight days left of pay, my August budget is in dire need of being stripped down to its bare bones. So, it's time to make some financial decisions: which of my monthly expenses can be cut back on temporarily? 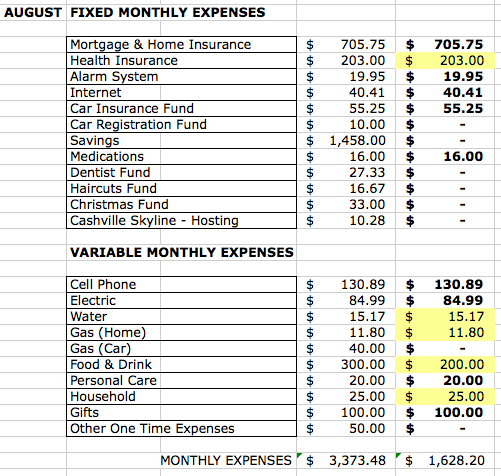 My monthly expenses fall into three categories: essential, negotiable, and non-essential. Essential expenses include: mortgage & home insurance, internet, alarm system, car insurance fund, medications, and utilities. Negotiable expenses include: health insurance, cell phone, food & drink, personal care, and household. Non-essential expenses include: car registration fund, savings, dentist fund, haircuts fund, Christmas fund, Cashville Skyline hosting, gas (car), gifts, and other one time expenses. Note: Cell phone bill is higher than usual because I massively went over my allotted minutes yakking about my employment status with any family member or friend who was willing to listen. Cheaper than therapy, though, right? 1. How many months I am expecting to be unemployed for? 2. Are there any additional streams of revenue that I can rely on? 3. Are there any side hustles I can work on in the meantime? 4. Are there any large expenses that may occur unexpectedly during this period? 5. How livable is my bare bones budget? Readers: Have you calculated your bare bones budget? What expenses have you deemed essential? Like what you've just read? Stay on top of Cashville Skyline by following me on Facebook, twitter, Google+, and Pinterest! Thanks for sharing, Kirsten! I hope to keep mine meager, even when my earnings bump back up. I keep track of my bare bones budget but it’s still probably skewed higher in some places, especially the food budget. If I was out of work I’d be back home so gas expenses and food expenses would be cut pretty drastically. My wife and I could take advantage of buying/cooking in bulk rather than both going solo since I work out of town. I’m greatly looking forward to eating more meals at home. I absolutely love cooking, but haven’t had enough time for it over the past few years. I like that phrase “bare bones budget.” We did a similar calculation a few months ago and called it uber frugal month. We employed essentially the same process you describe. We divided our expenses up into just two categories: fixed mandatory and able to reduce/eliminate. Then, we went to town on the reduce/eliminate category. I think it’s a great exercise and for us, it exposed a bunch of stuff that we thought were necessities, but that we were actually able to reduce/substitute or get rid of. We’ve been able to stick to this budget so far…fingers crossed! Good luck to you! That’s awesome, Mrs. Frugalwoods. I’ve loved eliminating unnecessary expenses from my monthly budget. It’s amazing how little we actually need. I try to live each month on a bare bones budget but it doesn’t always work out that way. After knowing everything we have to pay, compared to what we usually end up paying, I think we could get by on about $1,000 for the month. 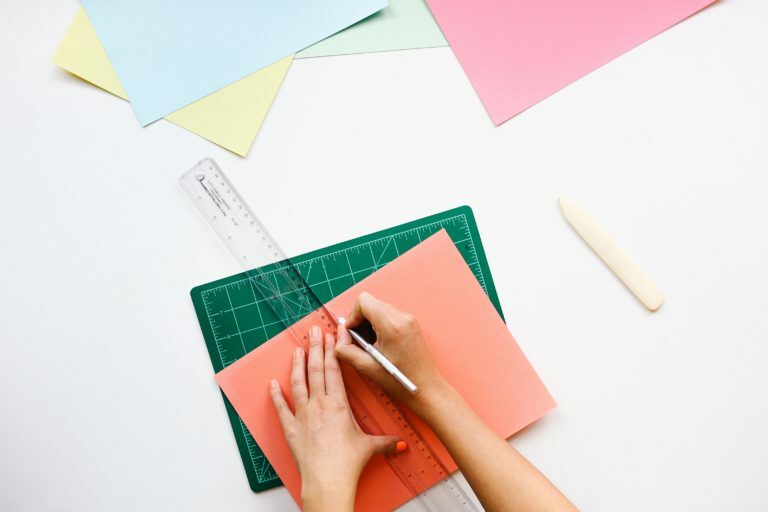 I think questions #4 and #5 are really important when calculating your bare bones budget, because if you only have enough to get by on the minimum, you’re putting yourself in a precarious position (although no more so than living paycheck to paycheck). $1,000 per month is seriously impressive, Ryan. I definitely have a few categories that could use a closer look. There are always ways to cut back further. Thanks, Kurt. I’m confident that these changes will make my transition much easier. We’re usually on a pretty strict budget every month, but we’ve been very lax this summer. For August, we’ve vowed to stay strictly within our set budget. Aside from rent and our car payment, we have some wiggle room. I think giving yourselves some wiggle room from time to time isn’t a bad idea. It’s impossible to stay on a strict budget forever. I actually think it is a great exercise to figure out your bare bones budget and live on it for a period of time (while you don’t need it). You not only save money, but you really figure out what you are capable of surviving on and you realize how much excess you really have in your life. Thanks, Shannon. I agree. August is going to be a struggle, but I’m hoping that I don’t have to dip into the emergency fund. Yep, we have this all calculated as well. It’s so nice that now with less debt (and eventually no debt) my bare bones budget gets smaller since I won’t have minimum payments to keep my debt current. It must be nice to have that extra cash, Alicia! Anytime I’ve paid off debts, I’ve tried to immediately funnel away that extra money. I have what I refer to as “The Sh*t Hit The Fan Budget” The eating out and monthly spending money alone would save us a decent amount as both would completely come to a halt. July was a rough month for eating out and I’m definitely going to cut that out for August. I’m going to continue to ride out my freeze on gifts (except for my friend’s wedding). As soon as we moved and had most of our expenses figured out, I calculated my separate bare bones budget. I basically eliminated any luxuries such as eating out, told myself I could only buy what’s absolutely necessary (and only on sale, or for a decent price), and made sure we were conscious of utility costs. I also put in the minimum I’d have to pay on my student loans. Thankfully, we had been working on cutting costs before moving, so there wasn’t much left to adjust, but we purposely got an apartment close to the boyfriend’s job so gas costs would be low. Sounds great, E.M. I’m going to stick to biking as much as possible in August. The cost for gas really ads up month to month. I would have to sit down and redo this. I’m curious to know how my grocery shopping would change. I certainly would have to let go of a few favorite things. I was wondering about the cell phone. Have you tried Skpye if you know you’re going to have months where you talk more? That helped me. I hope your unemployment doesn’t last long! I really want to switch to Republic Wireless, but I’m nervous about the service. I’ve been with Verizon for so long and I’m don’t think I would adjust well to Sprint. It’s such a huge expense, though! I ran the idea by my family and asked if they would consider Google Hangouts or Skype. Thanks for the encouragement, Tonya! Yes, we have a ‘now’ budget and a ‘when we retire’ budget. The retirement budget required us to really think about what is essential versus what is just to have. That’s great, Jean. I’m trying to encourage my parents to live on a retirement budget and make sure it’s realistic for them before they make any changes. They’ve never attempted to cut back, so I’m not sure if it will be easy for them. Yes, unfortunately we’ve been there in the past :-(. Health insurance is essential for us. Tiny Tre was born with a pre-existing condition and we can’t afford to lose coverage. Health insurance is essential for me, as well, but I’m going to opt for a higher deductible. I’d rather pay lower premiums during this transitional period. My goal is to always live on my bare bones budget. Right now I’m paying things down and cutting ongoing expenses so that I can free up more cash for more important things. I’m getting closet to the benchmark that I’ve set for myself. Love it. This is great, Michelle. It’s a great feeling to cut back on expenses, even when you don’t need to. Keep up the great work! This is a great idea. I think whatever you answer for “how long will I be unemployed for” you should add 1-3 more months just in case. Our emergency fund was not calculated correctly and we had to pay for it when the unthinkable actually happened. Great point, Michelle. It’s hard to say how long unemployment will last and we should all be prepared for that. You’ve done an incredible job sharing your budget! Reminds me that I should share mine again! It’s been a while since I analyzed mine. Thanks so much for the encouragement, Sam. I’m nervous to share my July budget. Another rough month in the food/drink category. All the more reason to make improvements for August, right? It’s amazing how every day things can be considered luxuries when we’re forced to cut back. Driving my car, eating and drinking at bars and restaurants, and saving for future expenses will have to wait. Our emergency fund is pretty light, so this is a great exercise for us to go through. Awareness is certainly a powerful thing. You’re controlling what you can, which is powerful. We know what our bare bones budget is…around $2K/mth & $1.5K if you remove the business-only expenses (but they’re attached to revenue, so we keep it in, as you did. Knowing what you can live on (even better if you’ve already proven you can) can bring enormous peace of mind when needed. It’s like a nice security blanket. BTW: I’m surprised that you consider the dentist fund as an optional expense. Prevention is the best medicine, isn’t it? Unfortunately, I haven’t had dental insurance for almost 8 years, but I still go every 6 months! I just pay out of pocket and pray that I don’t ever have any cavities. You pay $130/month for your phone bill?! Once your contract runs out, I’d recommend an off-contract plan! There are options from T-mobile, Virgin Mobile, Boost Mobile, Straight Talk, Page Plus, Net10, payLo, and others–for between $30 and $50 per month! Straight Talk (Wal-Mart’s brand name; service provider varies by area) provides unlimited text, data, and talk for $45/month! The savings after only a year would be about $1000!